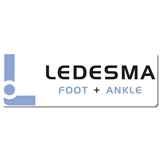 Ledesma Foot + Ankle (Scottsdale) - Book Appointment Online! The mission of Ledesma Foot & Ankle is to care for all patient’s with the utmost dignity and respect and offer the latest and most advances medical treatment for disorders of the foot and ankle. Our physicians will focus on quality patient care and provide a comprehensive medical approach to resolve their health issues. Along with offering specialized surgical and non-surgical treatments, products and services will also be offered to address general wellness and prevention concerns. By forming meaningful relationships with our patients and the community, we will establish ourselves as the premier lower extremity care center for the promotion of healthy living.